Join Us!!! We are looking for someone to help us cover NAIA basketball. Please send us an e-mail. 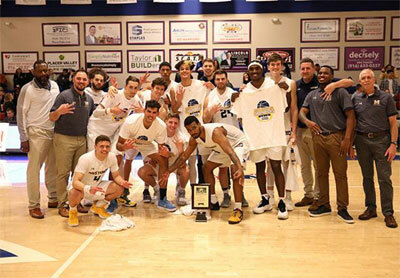 Before The Master's University beat William Jessup 89-74 inside Warrior Arena in Rocklin on Saturday, no men's program had ever won three straight Golden State Athletic Conference tournament titles. Tim Soares (6'10''-C) scored a game-high 24 points, and Delewis Johnson (6'3''-G) added 22 as the Mustangs pulled away in the second half, avenging a loss at Jessup in early February. What's more, the Mustangs (27-5) won their eighth consecutive game and earned the GSAC's automatic berth to the NAIA national tournament. "This is what we expected when Kelvin Starr came in as our coach three years ago," said Johnson. "It's a great feeling, taking care of business, but this doesn't mean anything without making a push toward a national title." The Mustangs will learn Wednesday who their first-round opponent at nationals will be when the NAIA releases its Division 1 bracket on Facebook Live. Saturday, Master's beat an exceptionally talented squad on its home floor. The Warriors (23-10) boast GSAC Player of the Year Keith Phillips (6'5''-F) (19 points), a dynamic backcourt and the NAIA's No. 19 ranking. The No. 5-ranked Mustangs countered with conference Defensive Player of the Year Soares, who on this night made his presence felt on both ends. "Tim had a monster game," said forward Brock Gardner (6'7''-F), who also presented issues for the Warriors, scoring 13 of his 17 points after halftime. "We don't win without his presence in the paint." Soares scored a game-high 24 points, with nine rebounds and four blocks. He scored four points during an important surge near the end of the first half. The Mustangs trailed 32-31 with 4:22 on the clock, but they finished the period on a 12-4 run and went into the locker room up seven. Johnson scored six points during the spurt. It set the table for what the Mustangs do as well as any team in the country: close. The Mustangs are 22-0 this season when they lead at half. Their advantage grew from seven to 18 early in the second half, and Master's led by as many as 22 later on. "It's tough to win the conference championship in a true road game," Starr said. "It was a bigtime performance from the guys." Despite winning its second consecutive regular season conference title, success came with more bumps in the road this season for Master's. The club lost four times during GSAC play, once at San Diego Christian, once at Vanguard and twice on a swing through Northern California in early February. Those losses to Menlo and Jessup marked the first time in more than two years that Master's had lost consecutive games. The Jessup loss was particularly painful. The Mustangs rallied to force two overtimes only to lose. This time, Master's made sure never to fall too far behind in the first half. "We were ready to play from the start (this time) and were focused and played together," said point guard Hansel Atencia (5'10''-PG-97), who had eight points and five assists. "When we play like that, we are really hard to beat. We have so many weapons, and we used them all really well tonight." After the buzzer, the Mustangs slipped on championship T-shirts and cut down the nets inside Warrior Arena. Now, it's on to Kansas City, where the team will look to avenge last year's stunning first-round exit. Johnson is already looking forward to it. "We're all locked in and ready," he said. G/F: Derek Novsek (6'3''-G/F) of San Diego Chr. F: Nick Crankshaw (6'4''-F) of San Diego Chr.